Perhaps you’ve heard the phrase by Buddha , “You only lose what you cling to”, but what does this really mean? 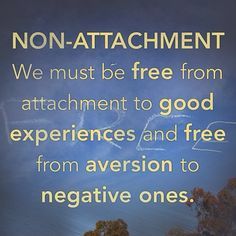 Unfortunately, non-attachment or detachment is greatly misunderstood in the mainstream and is often thought to mean that one completely shuts down emotionally and refuses to care about anything outside of themselves anymore, but this couldn’t be further from the truth. When we think of a river flowing, non-attachment is kind of like that when it comes to our emotions. Rather than letting one particular emotion dam up the waters of our soul, we simply let it run it’s course without becoming enthralled or entangled in it’s web. With negative emotions we tend to let them take the wheel and direct our thoughts, actions and reactions. And while we can see how asinine this is when others do it, while we ourselves are in the throws of anger, we feel completely justified because we’ve allowed the emotion to take control, overpower us and run wild. We are no longer connected to our hearts, and therefore are disconnected from the targets (other people) now receiving our wrath. With positive emotions, we tend to cling and hold onto them out of fear they will go away. We want them to stay and last forever, rather than being at peace with the fact that nothing ever does. This takes away from our ability to truly appreciate things in the moment, because we’re always away from it in the future, planning on how to keep it from getting away from us. The true beauty of non-attachment is that it allows us to feel emotions, but from a completely different perspective than ever before. Instead of avoiding all the “negative” ones or letting them overtake us, we are diligent in keeping control and choosing our next action; we do not let the emotion decide for us. We realize we are not victims to the emotion, we are not it’s minion and the emotion isn’t there to rule over us anyway…but it inevitably will if we let it. Emotions are way-showers if we know how to look at them. They show you where your triggers are, where your un-healed pain remains, and where your passions and desires lie within your heart. 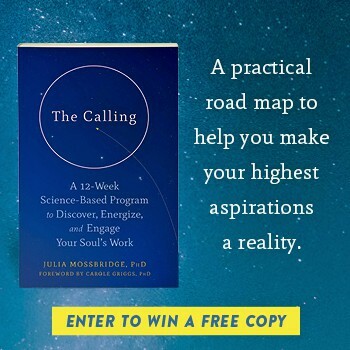 Unattached, emotions can help guide you into a purpose-driven life, or if we cling to hard, they can keep you stuck in an abusive relationship or career you hate. We must first be willing to look at them for what they are, then we can start to change the way we interact with our own emotions. I’ve heard people say, “I can’t change who I am.” or “I can’t change the way I feel.” Both of these statements are the result of a child being conditioned to believe they are powerless over their own lives. Children who’ve grown into adults now either fearful, resentful or hateful towards a world that they’ve forever had to bend and break for time and time again, but that will not even throw them a bone. And with this perspective…it never, ever will. That always hits home with me because I was/am one of those people. I struggle to this day with self-love, confidence and empowerment. But what I’ve come to learn is that our emotions and feelings are not our enemies and when we can learn to use them as the tools they are, we begin to slowly regain our power, and once you get even the slightest taste of your own true authentic personal power that’s been lying dormant in your heart for so long, you almost demand of yourself to come flying out of victim-hood. To wrap things up, non-attachment isn’t dimming your fire or passion. It isn’t denying how you feel. It is merely taking the steps necessary to discipline yourself to not stay IN one emotion, because we’re not meant to. Our natural state is neutral (no coincidence they are such similar words) and to remain balanced; and practicing non-attachment allows us to live a more balanced life. Of course we will still have times we cry, we’ll still get angry, we’ll of course still laugh and smile, we are human and that’s what this crazy ride is all about…FEELING. That means riding the wave…allowing the emotions to rise, and then fall and dissolve away. Let us remember that love is not an emotion, but a state of being. If you feel the need to feed emotional drama, negativity, etc. then I would definitely suggest taking a look at how you handle emotions in your life. There’s nothing to feel bad, ashamed, guilty, or mad about it, this is all a process of growth and expansion into a greater understanding of ourselves. I am looking for the other comments. I don’t see any. I agree. I have enough insight to know that I am not the feeling of good or bad, guilt or Shame. Because I’m not good or bad. I am only who I am. And feeling guilt is a trap and I’m riding it out. I know it’s all for a deeper understanding of who I really am. I didn’t like experiencing the situation that brought negative feelings about myself or what happen. It, too, is a learning experience. I responsible for learning from it and having better results when that situation arises. I can change and have results that are positive. But I better change fast and jump on the experience. Not let it repeat. If I could go back and change my reaction to the stimulus then I would but I can talk about it, detach, and learn. Otherwise, I don’t want to put myself in that situation again. So it bothers me that I can’t go back but I have hope that writing this and being aware, talking to other people, reading others comments or reading a similar article, that I can become more self aware. Then any ‘X’ situation will yield better results. Thank you. “…feel the need to feed..’ my drama. Eye opener.